Rochester New York's premiere wedding planning website! Planning your Rochester wedding in the social media era! With the emergence and ever evolving convenience of the internet, the way future brides (and everybody else for that matter) shop for items, vendors & services, browse for ideas & the latest trends as well as catalog and track their planning progress has changed drastically in the last decade and will no doubt continue to evolve in the foreseeable future. Many wedding type websites have popped up out there offering an ensemble of intriguing options, a little of this here-some of that there, but the idea of combining all of the necessary features and professionals in a localized setting seams to have been overlooked (wow, that photographer's work is fantastic...too bad they are six states away). 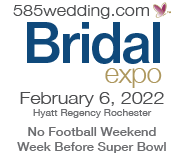 Combining the best on-line features, tools, tips and information with the finest wedding professionals and service providers in the Rochester area, we are determined to be the number one wedding planning source in the 585 area. We are focused on providing an environment where future brides will feel at home and utilize on a daily basis, sharing the excitement of their experience with family and friends as they plan for the perfect Rochester wedding. We welcome your ideas and feedback! Our mission is to provide the most unique Rochester wedding planning experience possible to our family of future brides and to connect them with the best wedding professionals in the area. With this in mind, we encourage you to contact us with any features or ideas you might have that would expand the capabilities of 585wedding.com and make your experience an even more enjoyable one! 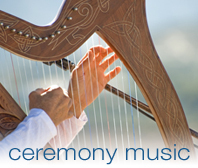 Share your wedding planning experience with family and friends! 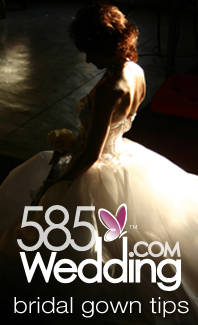 Your 585wedding.com account allows you to set up and maintain your own personal wedding website viewable only to those people you grant access. 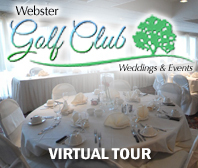 You can decide what is viewable to your visitors and keep everyone up to date with all the exciting details involved in the process of planning your Rochester dream wedding as they unfold. Post topics of discussion on your community blog page, upload photos to your photo gallery, your family and wedding party pages and set up and keep track of your expenses utilizing the My Budgeter and My Payments features. Post important dates to your personal calendar, add email reminders and choose whether or not events are displayed to your guests on the website! Set up your guest list and notify guests by email of important events or changes with a simple click, send invitations to your website, allow for RSVP's through your site and more! Continue to use your account after the big day! After the wedding, you can continue to update your website with photos from your wedding, honeymoon, etc. Utilize the My Gifts feature to list your gifts and manage your thank you notes. There is no expiration of your site unless it remains dormant for twelve months following your wedding date or you request it be removed! Close your eyes, take a deep breath and picture yourself on the day of your wedding, holding hands and gazing into one another's eyes as you exchange vows. Where do you see yourself? Are you in a beautiful, Rochester, NY area church or cathedral, or in an open grassy field surrounded by breathtaking flowers and nature? What colors are your bridesmaids wearing? How many guests are sharing your day with you... do you see virtually everyone you know, or just a small intimate group? Now picture yourself at your reception, sitting together at the head table, cutting your cake, having your first dance, dancing into the night with your guests to your favorite songs... Are you indoors or outdoors? Beneath a large tent lit up with twinkling lights or in a great hall under a chandelier? What is the atmosphere like? Both you and your significant other should do this exercise. Try imagining your perfect Rochester, NY wedding and what it would be like barring expenses and then discuss it together. Take notes and jot down ideas. Conflicts are likely to arise, but compromises can be worked out. You don't need hard, fast details at this point, mainly general ideas. Nothing is set in stone, and will undoubtedly change as you set your budget and confirm the detailed decisions together, but you now have a place to start.